September promises (maybe) cooler temperatures and a gradual switch from summer produce to fall favorites. I can almost taste those first leaves of komatsuna, karashina, and arugula now...but I'm getting ahead of myself. As always, there's more good farmer's market opportunities in Tokyo than one might have ever imagined possible in this megalopolis. Markets here, just as they are anywhere else in the world, are a great chance to explore, meet people, practice language, and create little bits of community while talking food. Sounds like heaven to me. Still no time listed, but I'd bet on 11am to 3pm. A new one for me, but I imagine it to be something like the Shinonome Market: small but good. 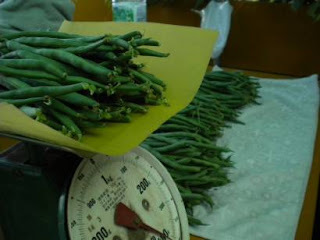 Today's photo comes from June at the farm when beans (engen) were in full swing. The fall planting is in, but August's high temperatures may have struck the seeds too hard. I'm feeling hopeful, and so am posting this picture.